USA's Meryl Davis and Charlie White perform a tango at the 2011 Four Continents Figure Skating Championships. USA’s Meryl Davis and Charlie White took the dance gold at the ISU Four Continents Championships after a dramatic turn events in which Olympic and World Champions Tessa Virtue and Scott Moir withdrew midway through their performance citing injury. Maia Shibutani and Alex Shibutani made it one-two for the U.S. team by claiming the bronze medal in their debut at their ISU senior level championships, while Canadians Vanessa Crone and Paul Poirier of Canada captured the bronze. Davis and White showed off their skills in their program to a selection of Tangos. All their elements were smooth and executed at high speed, and the lifts drew gasps from the crowd. However, the World and Olympic silver medalists also expressed the music very well and looked precise and sharp as the character of the Tango requires. The Americans had a level four for everything but the two step sequences that were a level three, and achieved a new season’s best with 103.02 points and a total of 172.03 points. Shibutani and Shibutani drew attention again with an excellent performance to Smile and Let’s Face the Music and Dance. They were rewarded with high levels for their elements, getting a level four for the lifts, spin, twizzles, and the circular footwork and a level three for the diagonal steps. The brother and sister team scored 93.34 points and moved up from fourth to second at 155.38 points. Crone and Poirier also did well in their routine to Eleanor Rigby. The only setback was a level two for the serpentine footwork. The Canadians scored 90.17 points and edged out teammates Kaitlyn Weaver and Andrew Poje for the bronze with 151.83 points. Weaver and Poje missed the bronze by less than one point. In their passionate routine to Moulin Rouge, they failed to complete the spin, which was a costly error. The defending champions earned 151.14 points. USA’s Madison Chock and Greg Zuerlein came in fifth (142.44 points) with an entertaining program to Cabaret. China’s Xintong Huang and Xun Zhen were solid in their dance to Singin in the Rain to finish sixth. The drama around Virtue and Moir unfolded about one and a half minutes into their program to modern Latin music. They had an issue with the twizzles, bumping into each other at the end, but continued with a smooth diagonal step sequence. The next element, a rotational lift with a spectacular, twist-like entry, looked fine too, but right after it, Virtue stopped. She skated to the boards and talked to their coaches Marina Zueva and Igor Shilpand, while Moir, after a moment, went over to the referee Alexander Gorshkov. The pause continued for a little while before Virtue and Moir withdrew, citing injury. The couple never came out to talk to the press in the mixed zone, but Skate Canada High Performance Director Michael Slipchuk gave a statement. “In her (Virtue’s) recovery, getting back into training, at times she still experiences some discomfort and so she’s been feeling just a little bit of discomfort in her quad area and still came and competed the short dance. But in the free dance, she was really was just feeling a lot more stiffness there and at that point just felt she wasn’t going to be able to continue all of the program,” he said. Slipchuk stressed that this “discomfort” had nothing to do with Virtue’s surgery on her shins. 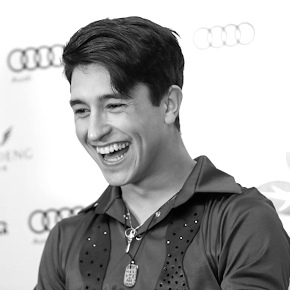 Daniel Samohin is the first skater from Israel to win an ISU Championship title (World Junior title in 2016) and the first Israeli single skater to qualify for the ISU Junior GP Final (2015). More on Daniel Samohin here in the GS Forum.